Accompanied by dramatic, eye-catching illustrations, the striking presentation of these 45 Old and New Testament Bible stories are uniquely dedicated to helping kids understand God’s presence and power in their lives through the Holy Spirit. 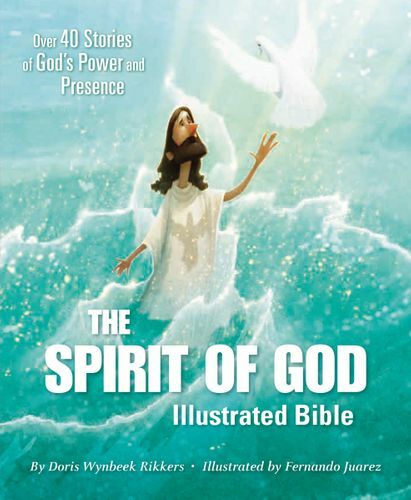 The Spirit of God Illustrated Bible is truly one-of-a-kind, focusing on Scripture passages that show how—from the glory of creation to the whisperings in our lives today—the Holy Spirit has been active in the world since the beginning. Most importantly, through this unique focus, children will grasp like never before how the Holy Spirit has been within each one them since they were born. Old and New Testament stories such as Adam and Eve, Abraham, Joseph, the Baptism of Jesus, and Pentecost come alive alongside dramatic illustrations by Fernando Juarez. Featuring a cover that glimmers and shines with foil, this is a special storybook Bible that will help children learn about and trust in the power of the Holy Spirit for life.